Last-minute rows over carbon markets threatened to derail the meeting – and delayed it by a day. 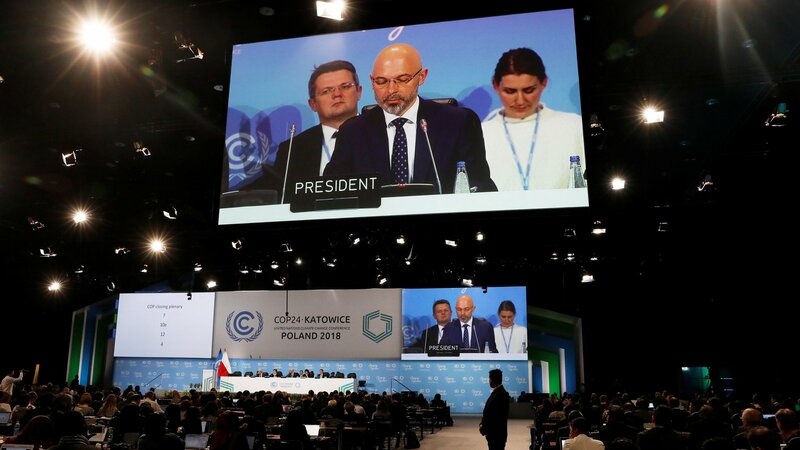 “Putting together the Paris agreement work programme is a big responsibility,” said the chairman of the talks, known as COP24, Michal Kurtyka. Rich nations often reduce emissions by paying for carbon-cutting projects in other countries. But these programmes are very difficult to police. Fraud and double accounting have rendered many of them worthless – they are often dubbed hot air schemes. The common rulebook envisages flexibility for poorer nations. Developing countries seek recognition and compensation for the impact of rising temperatures. Last weekend, scientists and delegates were shocked when the US, Saudi Arabia, Russia and Kuwait objected to the meeting “welcoming” a recent UN report on keeping global temperature rise to within the 1.5C limit. Keeping to the preferred goal would need “rapid, far-reaching and unprecedented changes in all aspects of society”. Representatives from 196 states took part in the talks. They were trying to sort out some very tricky questions about the rulebook of the Paris agreement. It sounds easy but is very technical. Countries often have different definitions and timetables for their carbon cutting actions. “The key piece was having a good transparency system because it builds trust between countries and because we can measure what is being done and it is precise enough,” she told BBC News on the sidelines of this meeting. She said that countries like Russia which had refused to ratify the Paris agreement because it wasn’t sure about the rules, could no longer use that excuse. In the words of one delegate, “it’s what’s possible, but not what’s necessary”. Business is also looking for a signal from this meeting about the future.